Instead of using OFFSET to create a dynamic range, you can use the non-volatile INDEX function. In the sample file there's a macro that will create the range names automatically for you. You can download and use the sample file, or create your own file to use, as described here. 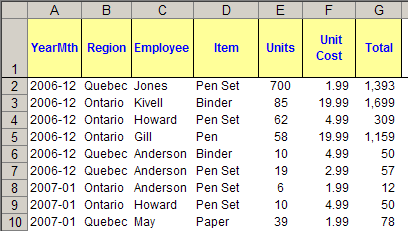 On the Data sheet in cells A1:G1, add the headings YearMth, Region, Employee, Item, Units, Price, Unit Cost and Total. 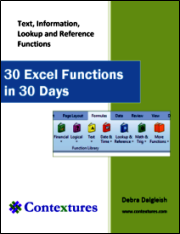 Enter sample data in each column or use the data in the zipped sample Excel Names file. Next, you'll create a dynamic range for the YearMth column. You could follow the same steps to create dynamic ranges for the remaining columns in the table, changing the column reference in the Refers To formula. We'll manually create one more dynamic range -- for the Region, which is in column B. You could repeat the steps for all the remaining columns, but that would be a long, repetitive process. To make things easier, and much faster, you can use a macro to automate the naming. This only requires a small amount of VBA code, as shown below. This code is also in the sample file that you can download. 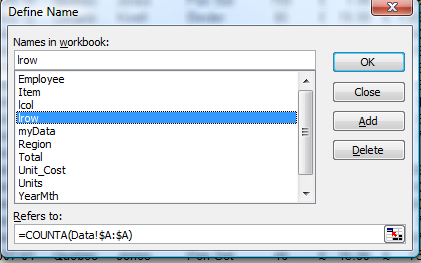 In addition to lrow, the VBA code creates a name lcol to hold the last Column number used on the sheet. It also adds a Dynamic Range called MyData which covers the whole data set and is then used when producing a Pivot Table. RefersTo:="=COUNTA($" & Rowno & ":$" & Rowno & ")"
RefersToR1C1:="=COUNTA(C" & Colno & ")"
"=" & Start & ":INDEX($1:$65536," & "lrow," & "Lcol)"
' spaces are not allowed in range names.
' names will only be created for those cells with text in them. & "Please Enter a Name and run macro again"
"=R" & Rowno + Offset & "C" & i & ":INDEX(C" & i & ",lrow)"
MsgBox "All dynamic Named ranges have been created"
") in procedure CreateNames of Module Technology4U"
Examples are shown in the sample file of how to use Sumproduct formulas with Range Names. 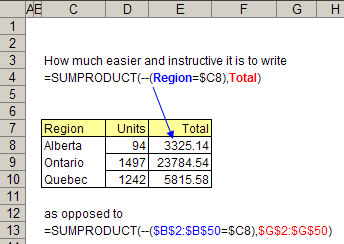 For example, instead of using range references in a SUMPRODUCT formula, you can use the Region name and the Total name. 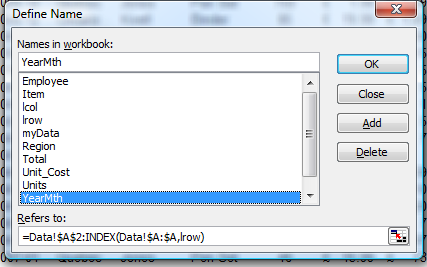 Examples are shown in the sample file of how to create pivot tables using Range Names. Then setting up a Pivot table report is very easy -- just use myData as the range in Step 2 of the PivotTable and PivotChart Wizard. 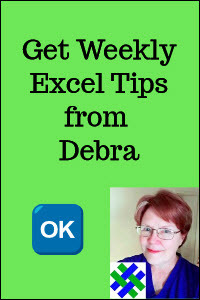 Select 'Microsoft Excel List or Database', click Next. And all the data is summarized, with no complex formulas required. Also, you can quickly rearrange the pivot table, by dragging the fields to a different location. For example, you could drag Item to the Row area, beside the Region field, for a different layout. After you add or change the data on the Data sheet, just right click anywhere on the Pivot Table and choose Refresh Data. All the values will be automatically recalculated.